I have a peculiar issue. 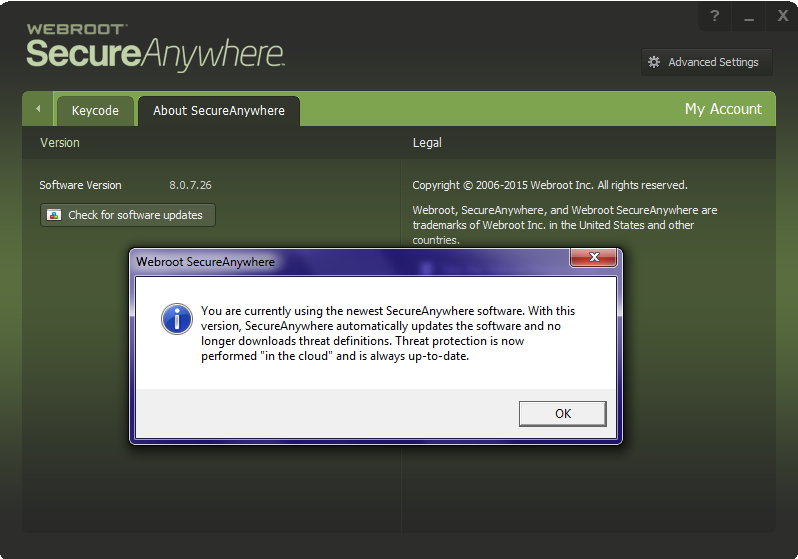 I purchased Webroot SecureAnywhere for three devices. I have it installed on two different laptops I own, but the web threat shield seems to only work on my older, non-preferred laptop. The Web Threat shield seems to be enabled on both PCs. Details follow. Web Threat Shield seems to work - search results show a dark green circle with a check mark, light green circle with a checkmark, yellow circle with a dash or orange circle with an exclamation point. Web Threat Shield doesn't show me any of the icons for search results. Most concerning is that I initially was blocked from visiting a page from a weather forecaster I follow on Facebook. It shows as an orangle circle with an exclamation point. Webroot listed it as a suspicious threat, "This is a suspicious site. There is a higher than average probability that you will be exposed to malicious links or payloads." My new PC which I love and adore allowed me to connect to the page without issues. I am hoping someone way smarter than me can help. If it serves any purpose, the website I was denied access to was http://illinoisstormchasers.com/. As I said, orange circle with an exclamation point, so proceed with caution. The owner of the page indicated he was seeing nothing nefarious with his site, details on why Webroot considers it malicious would be a nice bonus. The biggest thing though - I want to make sure my shiny, new Ferrari of a laptop is protected from mailicious websites and I fear it may not be currently. Well, the first thing that I would do is to check for updates (either rightclick on the notification icon and select 'Check for Updates' or go into the main app, click on the gear/cog to the right of 'My Account', and from the panel that opens select the 'About SecureAnyWhere tab. On that tab you need to click on the 'Check for software updates'. The reason I say this is that the latest current version is v8.0.7.66, and so if what you have listed is true you are some way behind the latest version. Updates should be 'pushed' to you and silent...but that does not always happen, etc. Just to ket you know that there are changes coming to the Web Threat Shield in terms of how it is works and what is used but we are still waiting for these to come out of the beat channel and into the release one. What yo could also try, which sometimes works, is to uninstall Firefox, reboot, download a fresh copy of the full installer, install from that, reboot and then try to see if when next running Firefox you get prompted to allow the extension. Finally, in terms of the 'nefarious' site; all I can say on that is (i) there a few cases of false positives and the way around that temporarily would be to click on the 'Unbloc and proceed' button in the bottom lefthand corner of the blcok screen...this will 'whitelist' the site for you locally and so should remove the block screen on future access attempts, plus it will also notify the Threat Researchers of the override and prompt them to investigate. In addition, you or the website owner my go to this site, (just follow the on screen instructions) to see how the site is classified by Webroot and then to this site, (it is self explanatory) and submit a URL Reputation Change Request to try to get the classification changed and therefore the Threat Shield response to be different. Hope that all helps? If not please feel free to come back with further quyestions. Thanks for the head's up on the most up-to-date version of the software. I have received an update, but not all the way to the version you indicated. I have included a screenshot illustrating the new version (v8.0.7.26) as well as the message received when requesting that it seek the update. Many thanks for your help Baldrick! Apologies...that should have been v8.0.7.66 rather than .26...I can find none and suspect that it is far too new for them to have been issued. So to check I just went over to the website and downloaded a trail version of the installer, which definitively gave the version as v8.0.7.66...so I do not think that I am misinformed or getting confused with the beta channel. I suspect that Release Notes will be out shortly. My Version of WSA Complete is showing as V8.0.7.26 as well. Maybe fix it in your Signature! 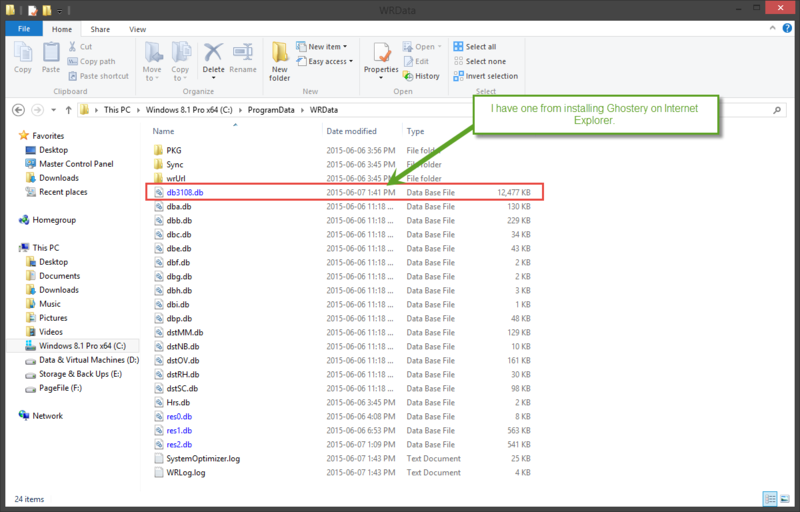 I had to uninstall Webroot (it had become corrupt along with deleting the WRdata file). When I reinstalled, Webroot no longer shows the Threat Icon on searches in FireFox nor IE. I looked in the Firefox addons and there isn't a Webroot addon that is disabled so there is nothing to allow. How do I get the threat icon back while doing internet searches? I believe I'm using the latest version 8.0.8.88. By the way, I rebooted the computer after the install. Well I guess the 3rd time is the charm. I just rebooted for the 3rd time and now the threat icon is working. Happy to know that Webroot is up and running the way it's suppose to, with the Webfilter working for you now. I've noticed that my WRData folder seems to have become bloated. In the past it rarely seems to get larger than 200mb. I just happened to check it because of the above issue and it is now at 1.3 gigs. Is this now the normal size of this folder or should it be smaller and if so how to slim it down? Please have a look at this Thread Here and hope it answers your question. With an uninstall/reinstall will fix this but if you have alot of unknown folders in the dastabase then they may need to be whitelisted anyways by submitting a Support Ticket, as @Rakanisheu and @RetiredTripleHelixhad stated in the thread. Yes contact support as Sherry has suggested to get your files whitelisted as I posted here: https://community.webroot.com/t5/Webroot-SecureAnywhere-Complete/Controlling-WRData-folder-size-help-needed/m-p/198224#M12012 and that will solve your issue! Is this situation a permanent one, if so it means that eventually many users will have to do the un/re, deep scan, raise ticket. Thanks for the advise...I have started a ticket. I understand the manual 'How to', but that misses my point. Given time a lot of people will have 'large' data files and it is reasonable to expect a professional company, like Webroot, to have a 'tool' to do a clean up now and again. Well, if you feel that there is a need for this then why not make it 'official' and open a Feature Request (link at the top of every page just left of centre) so that (i) the Development Team are aware of this, (ii) other users can comments and support the idea if they agree & (iii) the Development Team will provide a status update from time to time in terms of whether or not the idea is reviewed, under consideration, accepted, under development, etc. It is the best way to move this forward. I know that some of my data files are due to an email client that updates often. Every time it does WSA starts asking questions & I raise a ticket to whitelist the folder containing the exe. The exe that WSA queries is not the problem, rather what it 'calls' in different combinations. It is a pain & I no longer use that client (lifetime Pro license) because security comes first & I can't be bothered. I'll map out a suggestion sometime. ps; it was/is called eMclient. Well it's already in WSA to clean up old monitoring files I just don't know when the clean up occurs (how much time passes till it does) so I will see if I can get some info on that! That is interesting, my oldest db.NNNN.db is dated 19/03/2014. So it's older than a year. This is what I sent to my Webroot Contacts! So I will or someone from Webroot will reply because a year is way to long IMO! I have one from today!